The Great Bradley, Suffolk windmill stood on the high ground at the top of Bradley Hill (which in ancient times known as Hanley Hill), as you climb up to leave the village going towards Newmarket. 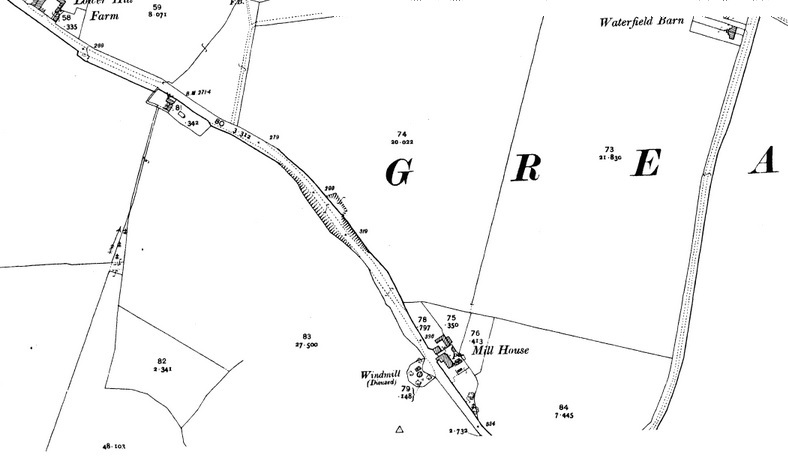 The site of the windmill is now marked by a clump of trees opposite what is now called Mill House. The mill was once part of the Manor. 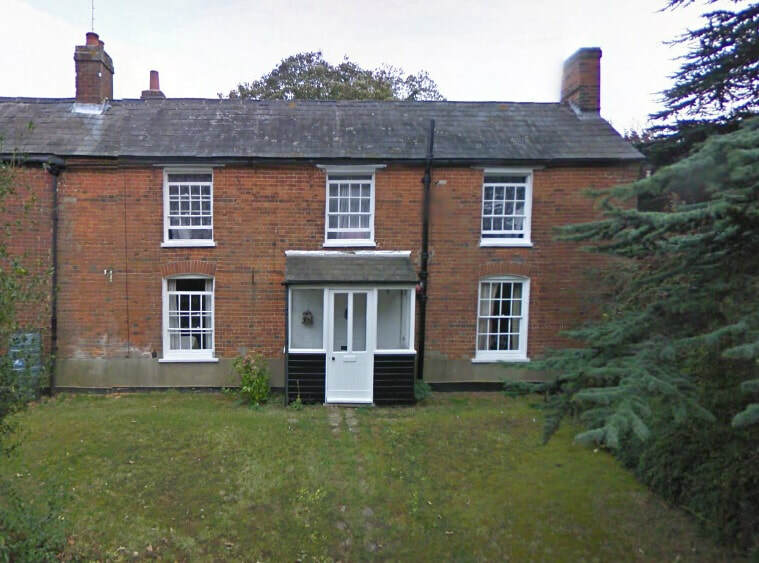 Since 1942, it had been in the ownership of Thurlow Estate and was always tenanted. It is shown on the St. John's College map dated 1793 as a Post Mill and was rebuilt as a Tower Mill in 1839 for the sum of £153. 4s. 2d. In the 19th Century the mill was operated by Hanslip Nice. From 1851-1871 Hanslip was the census enumerator. From 1881 - 1901 the task was taken on by his son, Josiah. In 1908, the miller, Josiah Nice, had extensive renovations carried out but, when the work had been almost completed, a bad thunderstorm occurred and lightning struck the sails causing a tremendous amount of damage. The miller had no money to spend on further refurbishment and was distraught. He killed himself. The mill fell into disrepair and was never worked again. By 1949, it had the remains of only two sails and was demolished at that time. Today there is merely a mound covered in shrubs where it once stood. 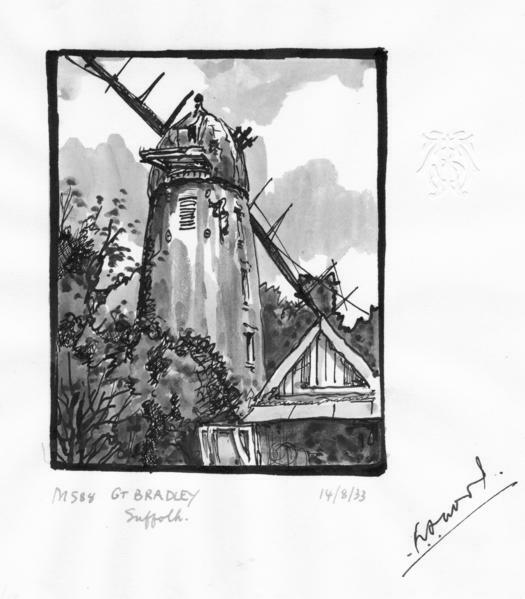 "Bradley Mill stood on the piece of ground opposite Mill House at the top of Bradley Hill. 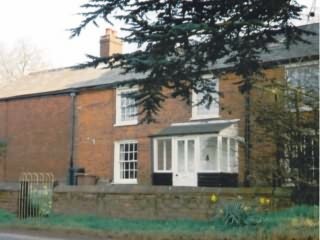 It occupied an unrivalled position, providing a fine panorama of the countryside surrounding, and it was a well-known landmark, particularly for the R.A.F. during the Second World War. 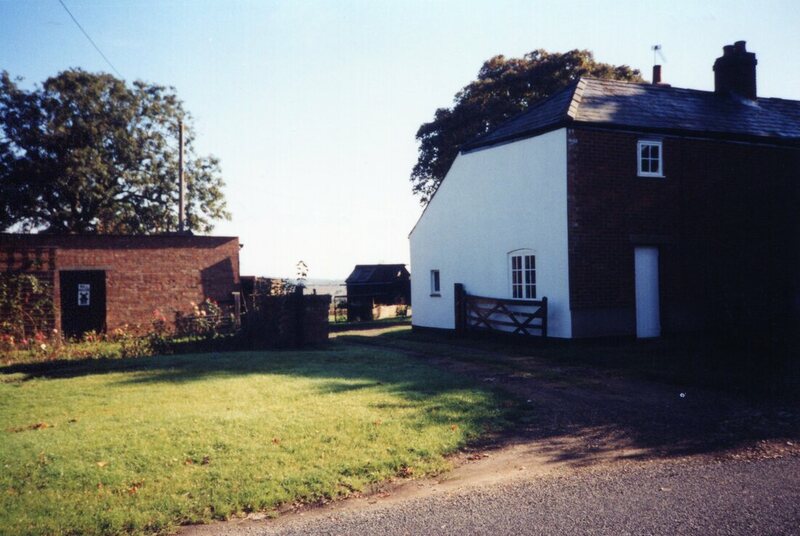 The Mill, as it is remembered, is said to have been built in 1839. 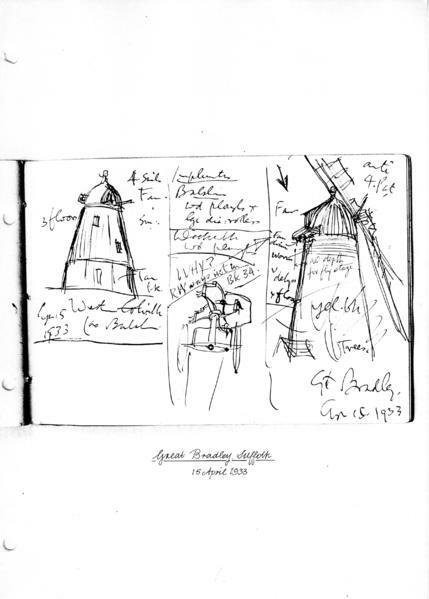 It was a Tower mill, that is brickwork up to the top, which turns to keep the sails face to the wind. The turning of the top into the wind was done by hand, the miller pulling on an endless chain. This turned the gears on the kerb at the top of the brickwork (later mills had a fantail which turned if the wind changed); it had four patent sails, that is, sails filled with shutters as against common sail, covered, when at work, by a cloth spread over the sail frame. 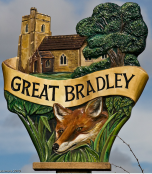 The miller provided bread from the mill for the whole village and his services would have been invaluable in the days when Great Bradley was a comparatively isolated community. We have some most interesting records of the last miller to have worked there, a man by the name of Josiah Nice. 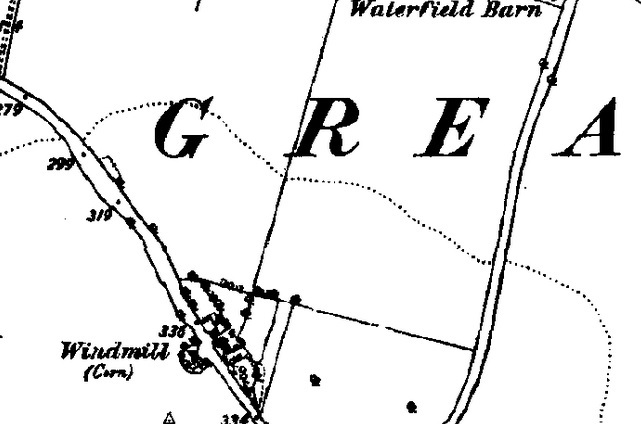 His father, Hanslip Nice, was also a corn miller before him, and he, too, lived at the Mill House. Hanslip Nice was miller until approximately 1888, when his son took over from him. At that time, Jo Nice is described as farmer baker and miller. In 1908, Jo Nice decided to have extensive renovations carried out on the mill, and for this he employed Hunts, the millwrights and General Engineers, of Soham. (Hunts were well known millwrights and they worked on most of the mills in this area from 1836 to 1954, when their business was sold). The renovations had almost been completed when a bad thunderstorm occurred, causing the miller and millwrights to take shelter in Mill House. A few minutes later, a flash of lightning struck the sails, and a tremendous amount of damage was done. The poor miller, having spent all his savings on repairs, could not afford the added expense, and a few days later he hanged himself. " "A Vestry Meeting was held in the Vestry on April 20th, 1908, at which the usual business of Vestries was transacted. During the past year the Rector had the misfortune to lose, in an untimely manner, his Warden, Mr. Josiah Nice, who died on Jan. 16, 1908. He lies beside his wife who had predeceased him some 4 years. For upwards of 30 years, he had acted as Rector's Warden, and the Vestry, in silence, recorded their sense of the loss of so long an inhabitant of the Parish." "On Thursday, 16th Jan. 1908, Mr. J. Nice committed suicide by shooting and hanging himself. He was buried at 2.30 p.m. on Jan. 19, and several people from Carlton and Thurlow, as well as some who seldom attend our Church in this Parish, were present at the funeral and stayed to service at 3 p.m."
It is not difficult to imagine how great a shock this incident would have been to the parish, and the mill was never worked again. It is recalled that Mr. Smith, who took over the house and farm, used to smoke hams in the bottom part of the mill and for this he used wood dust which came from the saw-mill at Thurlow Hall. "Further along the road is another old relic, but in this case rather a sad one, for here is but the stump of what once was a busy mill whose sails for many years turned sweetly in the wind which so often blows across this delightful prospect of hill and valley. For certainly the prospect here is delightful, providing as it does a vista of fields tinted by nature into various shades from yellow to green, the whole intersected by hedges and dotted by stacks and a few red-roofed or thatched inhabitations, so that the panorama seems like a lovely picture transferred to canvas by the skilled craftsmanship of some pastoral artist. And so the mill stood until 1949 when it had only the remains of two sails. By that time, there were two or three bad cracks in the brickwork and it was thought to be unsafe. It is a theory that if only steel bands had been fixed around the brickwork, it would have stood there now, a fine reminder of days gone by. Instead, it was pulled down, not without considerable difficulty, and all that remains is a mound of earth." The following more pictures are part of the University of Kent The Donald W. Muggeridge Collection of Mill Photographs click here.